Italian super sports car maker Lamborghini is surprising audiences at the 2010 Beijing Motor Show with an exclusive edition of the Murciélago LP 670-4 SuperVeloce. The Chinese Edition is limited to not more than ten numbered cars and will be offered to the growing group of sports cars collectors in China only. Furthermore the Gallardo LP 570-4 Superleggera is celebrating its Asian premiere in the Beijing. "Automobili Lamborghini's strong performance at the 2010 Beijing Auto Show and its launch of a special edition of the flagship Murciélago LP 670-4 SuperVeloce exclusively for the Chinese market underscore our unwavering commitment to China and the development of a super sports car culture here," said Stephan Winkelmann, President and CEO of Automobili Lamborghini S.p.A. "Last year, Automobili Lamborghini achieved 11 per cent growth in China. At the beginning of this week on 20th of April, we have launched our seventh Automobili Lamborghini China dealership in Shenzhen. The inauguration of our eighth showroom in Xiamen will come soon. It is our pleasure that we can share our passion for Lamborghini with China's super sports car drivers, collectors and fans." Winkleman said last week. Limited to only ten cars worldwide, the special edition Murciélago LP 670-4 SuperVeloce is designed and manufactured exclusively for China's most discriminating super sports car enthusiasts. An orange stripe, symbolising the strength of an erupting volcano, decorates the flat grey painted carbon shell of the Murciélago. Every model holds a numeration badge with the name of its owner. The Lamborghini Murciélago LP 670-4 SuperVeloce is one of the most fascinating super sports cars of all times. The exceptionally purist and even more extreme top model - the Murciélago LP 670-4 SuperVeloce - is even more powerful, lighter and faster than the Murciélago LP 640. With the output of the 6.5 litre V12 increased to 670 hp and a weight reduction of 100 kg (220 lbs), the Murciélago LP 670-4 SuperVeloce boasts a power-to-weight ratio of 2.3 kg (5.1 lbs) per hp. 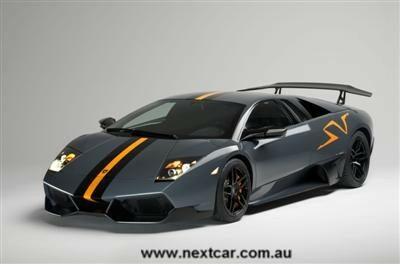 It vaults itself from zero to 100 km/h in just 3.2 seconds and hits a race-trck top speed of 342 km/h. With its outstanding performance, razor-sharp precision and exceptional high-speed stability, the Lamborghini Murciélago LP 670-4 SuperVeloce is the ultimate performance car for advanced sports car drivers. In order to achieve the substantial weight reduction of 100 kilogrammes (220 lbs), the Murciélago LP 670-4 SuperVeloce was extensively reworked and redeveloped in virtually every aspect - from chassis to engine and transmission, right through to the interior. The increase in engine output from 640 to 670 hp is the result of optimised valve timing and a reworked intake system. The significantly modified aerodynamics with substantially increased downforce brings considerable improvement to vehicle stability at very high speeds. The large 'Aeropack Wing' and its added downforce give a top speed of 337 km/h (209 mph) where legal. The Lamborghini Gallardo LP 570-4 Superleggera is the new top model of the Gallardo line. Its 'superlight' name describes a high-performance driving machine with a true sporting character and an automotive high-performance 'athlete'. In comparison to the already slimmed-down Gallardo LP 560-4 the weight of the Gallardo LP 570-4 Superleggera could be reduced 70 kilogrammes. So the dry weight of the new Sant'Agata Superleggera is just 1,340 kilogramme - a new benchmark in the very exclusive market of extreme super sports cars. The use of carbon fibre for external and internal components is heavily contributing to the weight reduction of the Superleggera. This carbon-composite material is ideal for super sports cars, combining weight reduction with improved technical characteristics. Reduced weight optimises the driving performance and correspondingly reduces CO2 emissions. For many years Lamborghini has lead the way in the use of carbon fibre and is now increasing its advantage even further. The 5.2 litre V10 engine output of the new Superleggera is 419 kW (570 hp). The power-to-weight ratio of this new top model amounts to only 2,35 kilogramme per hp and guarantees a breathtaking driving performance. The Superleggera accelerates from 0 to 100 km/h in just 3.4 seconds and ultimately reaches 325 km/h. The petrol direct injection engine 'Inezione Diretta Stratifica' achieves an impressive efficiency: fuel consumption and CO2 emissions dropped 20.5 per cent in comparison to the previous model. The booming Chinese automobile market has matured and provided a culture in which the brand of the raging bulls has taken root. In 2009, Automobili Lamborghini delivered 80 new cars to the communist controlled country, achieving 11 per cent year-on-year growth. With six dealerships in Guangzhou, Shanghai, Beijing, Chengdu, Hangzhou and Hong Kong, Lamborghini unveiled a new dealership in Shenzhen last week. Another showroom in Xiamen will soon follow.